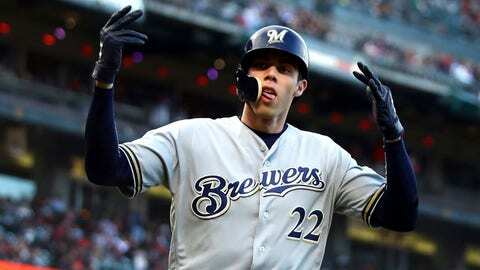 LOS ANGELES — The situation started to look bleak on the first day of the second half for the Milwaukee Brewers. Less than two weeks later, the momentum has changed. The Brewers will head into their game against the Los Angeles Dodgers on Thursday with a chance to win a four-game series. They could have been lined up for a sweep, but dropped a 6-4 heartbreaker in 10 innings Wednesday. When the Brewers lost to the Dodgers at home July 20, it was their seventh consecutive defeat and it appeared as if their early season success put them on a pace too difficult to maintain. Now the Brewers are looking as good as they have all season, even with Wednesday’s defeat. While winning eight of 12 games, they have bolstered the infield with two trades and the bullpen with one. The Dodgers are reaping the rewards of their own deals. They snatched the biggest prize of the trade season when they pried third baseman Manny Machado from the Baltimore Orioles. He has two home runs with the Dodgers, including one in the current series against Milwaukee. And like the Brewers, the Dodgers landed a second infielder (Brian Dozier) and a bullpen piece (John Axford). Dozier had three hits in his Dodgers debut Wednesday, including a home run. The Dodgers ended their three-game losing streak with Wednesday’s victory and are trying to find some traction in the second half, where they are 7-6. The Brewers will send Jhoulys Chacin (10-3, 3.45 ERA) to the mound Thursday as they go for the series victory. The right-hander will make his team-leading 24th start of the season with the Brewers going 16-7 in his outings. Chacin is 11-8 in 25 career appearances (24 starts) against the Dodgers with a 4.03 ERA. He is 5-4 with a 3.08 ERA in 10 starts at Dodger Stadium. The Dodgers will send staff ace Clayton Kershaw (4-5, 2.52) to the mound Thursday. His losing record has come despite holding opponents to a .230 batting average with 9.2 strikeouts per nine innings. He’s coming off a dominating start at Atlanta where he gave up one run in a season high 7 2/3 innings. Kershaw is 5-5 with a 2.85 ERA in 15 lifetime starts against the Brewers, while holding Milwaukee hitters to a .208 batting average and a .352 slugging percentage.